Bulgarian fortified town, situated at the confluence of the rivers Widd and Danube. The beginnings of the Jewish community of Widdin were in the thirteenth century, its earliest members being some Byzantine and Hungarian Jewish settlers. At that time the city was a part of the territory of the waywode of Wallachia. Accordingto several chroniclers, two celebrated rabbis went to Widdin in 1376—Moses Yewani ("the Greek") and R. Shalom of Neustadt. R. Shalom is said to have founded the first rabbinical school in Bulgaria, and to have been the first rabbi of the community; he was succeeded by R. Dosa Yewani, the son of Moses Yewani. After the taking of Constantinople in 1453, during the campaigns of Mohammed the Conqueror in Anatolia, the waywode of Wallachia, Vladimir V., levied on every Jew of consequence a tribute of 1,000 silver aspers per head, fixing the loss of the right eye or the right ear as the penalty for failure in payment. The Jews of Constantinople appealed, in the name of their coreligionists, to the sultan Mohammed, who, according to the statement of Elijah Capsali, revoked the barbarous edict on his return from Anatolia. This was prior to his expedition into Transylvania in 1474. In spite of its final conquest by the Turks, Widdin remained under the immediate government of the rulers of the province of Wallachia, then tributaries or vassals of the Ottoman empire. In the seventeenth century the city passed for a time into the hands of the Hungarians, but was again surrendered to the Turks (1690). In the interval Jews of different nationalities settled in the city. Among the principal families of Greek origin were the Pyzantes (or Byzantes), Pappos, and Polychrons; among those of German extraction were the Ashkenazis and Grünbergs; of Spanish origin (after the year 1492), the Peñaroya, Dueñas, Niño, and Rosañes families. There were also Portuguese Jews, as the Namias; Italian, as the Farḥis of Florence and Lecce; French, as the Yarḥis of Lunel and the Ḳimḥis of Provence; and even some natives of Barbary, e.g., the Al-Ḳala'is, the Al-Ajams, and others. A responsum of Samuel of Medina, dated 1558, reveals the fact that the Jews of Widdin were extensive cheese-makers, the principal manufacturers of that time being Joseph Tchillek and Solomon Uriel. In the year 1784 the Ventura family removed from Spalatro, in Dalmatia, and settled in Widdin, where it founded a dynasty of spiritual rulers. The following members of this family were successively rabbis of Widdin: Shabbethai b. Abraham Ventura, David Shabbethai Ventura (1784-1806), Raḥamim Abraham Ventura (1806-10). Gedaliah Shabbethai Ventura, and Joseph ben David Ventura. Other rabbis later on were Benziyyon b. Shabbethai, Abraham Cohen, Bekor Eliakim, David Cohen, and Solomon Beḥar David. 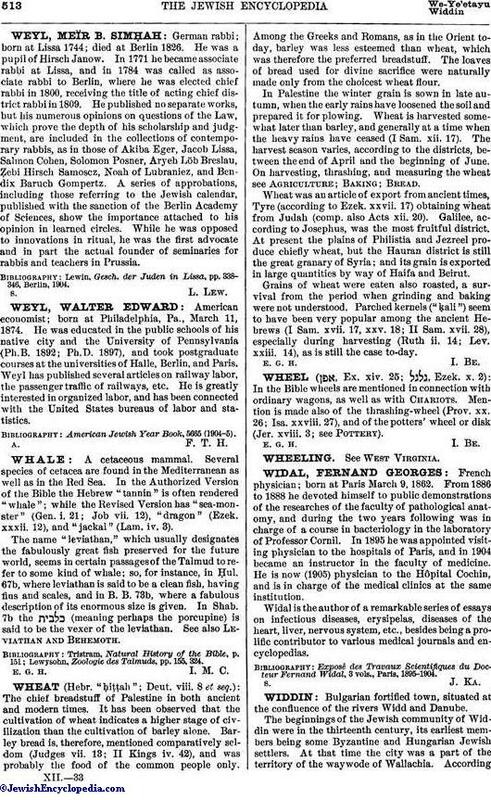 Among the notable events in the history of the community of Widdin was the incident of the Jewish physician Cohen, falsely accused of poisoning his patron, Passvanoglu, the governor of the city, in 1807. This event, which came near being the cause of a wholesale slaughter of the entire community, occasioned the institution of an annual feast-day (4th—some say 9th—of Ḥeshwan), known as the Purim of Widdin, in thanksgiving for its escape. About 1830 one Conforte b. Eliakim, a native of Salonica, was the "ḥakim-bashi," or physician, to the governor. During the war between Servia and Bulgaria in 1885, when Widdin was being bombarded, the Jews of that town took refuge in Kalafat, Rumania. This occurred in midwinter; and the Jews, without means and wholly unprepared for flight, had no other refuge than the ancient synagogue. Widdin was the first Bulgarian community to produce a Jewish writer of note; this was R. Dosa Yewani, author of "Perush-we-Tosafot," written about 1430 and still (1905) preserved at Wilna (Michael, "Or ha-Ḥayyim"; Benjacob, "Oẓar ha-Sefarim," s.v.). 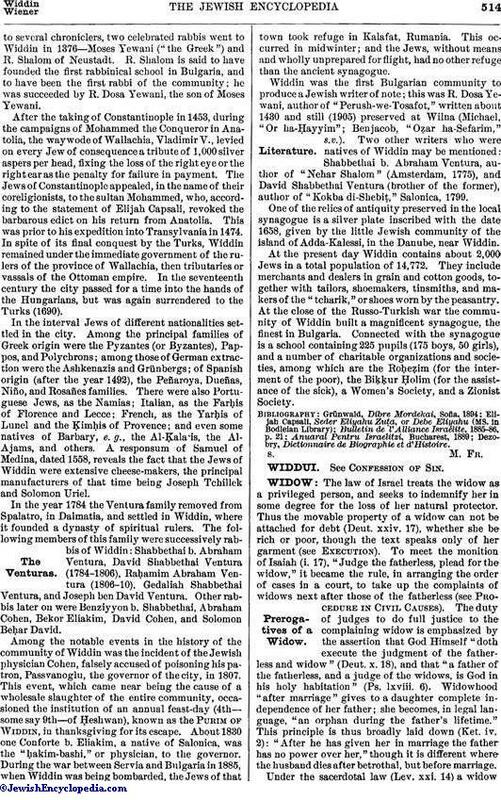 Two other writers who were natives of Widdin may be mentioned: Shabbethai b. Abraham Ventura, author of "Nehar Shalom" (Amsterdam, 1775), and David Shabbethai Ventura (brother of the former), author of "Kokba di-Shebiṭ," Salonica, 1799. One of the relics of antiquity preserved in the local synagogue is a silver plate inscribed with the date 1658, given by the little Jewish community of the island of Adda-Kalessi, in the Danube, near Widdin. At the present day Widdin contains about 2,000 Jews in a total population of 14,772. They include merchants and dealers in grain and cotton goods, together with tailors, shoemakers, tinsmiths, and makers of the "tcharik," or shoes worn by the peasantry. At the close of the Russo-Turkish war the community of Widdin built a magnificent synagogue, the finest in Bulgaria. Connected with the synagogue is a school containing 225 pupils (175 boys, 50 girls), and a number of charitable organizations and societies, among which are the Roḥeẓim (for the interment of the poor), the Biḳḳur Ḥolim (for the assistance of the sick), a Women's Society, and a Zionist Society. Dezobry, Dictionnaire de Biographie et d'Histoire.